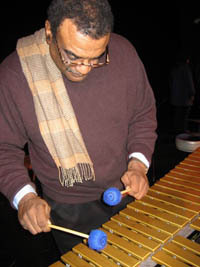 Percussionist Joe Chambers has had a long and distinguished career in music as both a leader and as a sideman. He's played jazz with many of the greats, including Miles Davis, Max Roach, Freddie Hubbard, Bobby Hutcherson, Sonny Rollins, Wayne Shorter, Charles Mingus, and Joe Zawinul. Chambers is also a composer and teacher. He taught for many years at The New School for Jazz and Contemporary Music in New York. Since September 2008 he's held the position of Thomas S. Kenan Distinguished Professor of Jazz at The University of North Carolina at Wilmington. On Saturday, January 19, 2008 at the Temple Theatre in Sanford, NC, Chambers taught a master class for high school students, performed at an open rehearsal, and later gave a concert. In an interview that afternoon, Chambers reflected on the popularity of jazz yesterday and today, and revealed the title of his favorite Sinatra song. When you were a kid, what’s the first jazz tune you can remember hearing? I grew up listening to rhythm ’n’ blues. Rhythm ’n’ blues is jazz. People don’t really know. Rhythm ’n’ Blues is like Kansas City jazz. But distinctly jazz? The tune that got me was a tune my mother brought. It was called “Up ’n’ Adam” by Lester Young. Your mom was a jazz fan? She was a musician herself, yes. She was a singer-songwriter. No. No. But she had the talent. Father did, too. They brought in all the stuff. All of the records. Buddy Rich was on that Lester Young record. He played this solo. This long roll. I said, oh wow. That’s what I want to do. I was already playing drums. And piano. I started out on piano. I couldn’t stick with the piano. But I was a drummer. Why didn’t you stick with the piano? So you switched to the drums? You play a wide variety of percussion instruments. You’re very versatile. That’s what a percussionist is. You have hundreds of instruments. You have not only drums. You have mallets, marimbas, vibes, conga drums, xylophone, and hand drums. There’s a wide variety of stuff that a percussionist has to deal with. The percussion timbre itself is the largest timbre in the orchestra. In a classical orchestra or whatever. When did you start playing the vibes? Well, I started playing the vibes seriously around 1970 when Max Roach started [the all-percussion octet] M’Boom. We all had to learn everything. So I started getting into it. Still learning. It has a motor on the side. It gives a note a ring. It gives a note a sustaining and a tremolo effect. That’s due to the motor and the peddle. It’s distinct from the marimba. Marimbas and xylophones are natural. It’s the same keyboard structure, but they have no motor. “The Outlaw” is a Horace Silver piece. When I grew up in the Philly area, we had what you call canteens—I don’t know how old you are—sandwich shops where you sit around and you eat these hoagies and steaks. And they had jukeboxes at every table. And in those days, they had the rock ’n’ roll and rhythm ’n’ blues on the jukebox. But they had jazz on it, too. And they had this tune, “The Outlaw.” And I played it all the time. It was hard bop. I fell in love with that tune since ’58. And I always wanted to do it. And I did it. But here it’s in a Latin vein. You never recorded the tune before? No. Horace Silver to me is one of the important composers in the idiom of jazz. When people start rattling off composers, they list Ellington of course. And Monk. And Mingus. And Miles. Horace Silver is not a name that rolls off your tongue. But Horace Silver is a very significant composer. All we musicians know that. Joe, you’ve been around for a while. The 1950s and 60s—we’re in 2008 now—what’s the difference being a jazz musician then versus now? 1960s jazz was very distinct. You could distinctly know what jazz was from, say, rock ’n roll. Now, it’s hard to define what jazz is with the advent of smooth jazz. Jazz at the time was on commercial radio. You see, that’s a key issue. Jazz today is relegated to NPR and public radio. Your audience is limited right there. Jazz used to be the mainstream music. It definitely was the mainstream music in the swing era. In the 1940s it got a little nebulous. It got away. And then they created rock ’n’ roll. That took it out of the mainstream. It’s definitely not the mainstream music today. And anybody can see that. It has nothing to do with the music. The music to me is the highest form along with classical music. But it is not in the mainstream. Do you listen to Ella and Sinatra? Do you have a favorite Sinatra tune? I think I know it. It’s on the Only The Lonely album. But how does it go? Don’t ask me to sing.